A new programme to attract and train sports coaches will begin at Medway Park, Gillingham in September. In recognition of the important role that coaches and volunteers play in grassroots sport, the Medway Sport team is launching a new-look programme to help attract and develop the next generation of coaches. The council is also working closely with national governing bodies to provide sport-specific level 1 courses for aspiring coaches to become qualified in a sport of their choice, as well as organising generic workshops to help enhance the knowledge and skills of existing coaches. A new introductory module, First Steps into Coaching, provides aspiring coaches with a general overview of the core skills needed to become a coach, as well support and an assessment of their training needs. The programme also offers regular education workshops to support the continuous professional development of coaches. Modules on offer include psychology, nutrition, basic anatomy and physiology, and preparing for and recovering from sport. Each module costs £25 and lasts three hours. Medway Park also hosts generic first aid and child protection training throughout the year – both essential qualifications for new coaches. 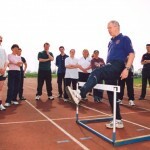 Medway Council’s Portfolio Holder for Community Services Cllr Howard Doe said: “Our coaches and volunteers play a vital role in coaching the local community, making it possible for more people to play and succeed in sport. All of the above workshops take place at Medway Park, Mill Road, Gillingham. To book a place on any of the Medway Sports Coaches programme, email [email protected] or call 01634 338766. This entry was posted	on Monday, August 19th, 2013 at 6:15 pm	and is filed under Athletics, Other Sports. You can follow any responses to this entry through the RSS 2.0 feed. Both comments and pings are currently closed.